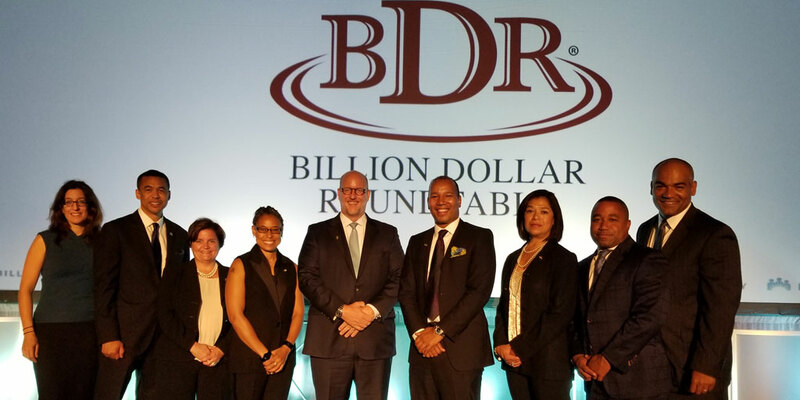 Merck has been inducted into the Billion Dollar Roundtable (BDR) at a ceremony that showcased the company’s commitment to economic inclusion and supplier diversity. As one of 27 member companies, Merck joins an exclusive group of U.S.-based corporations that have attained $1 billion or more in annual supply-chain diversity spend. "We are honored to become part of the Billion Dollar Roundtable," says Quentin Roach, chief procurement officer, Merck. "At Merck, we value diversity and believe that having a diverse supplier base helps us better understand and anticipate the needs of the people we serve. We look forward to sharing best practices with other companies that share in our commitment to diversity and inclusion." Merck was invited to join the BDR in March. Other members include Apple, Boeing. Comcast NBCUniversal, CVS Health, Dell, Ford Motor Co., IBM, Johnson & Johnson, The Kroger Co., Microsoft, Procter & Gamble and Wal-Mart. "Merck's induction strengthens the BDR's portfolio of member companies in key fields of medicine, health care and scientific research," says BDR President and CEO Sharon Patterson. "Collaboration is essential to the success of the BDR, and Merck's participation and thought leadership will greatly enhance the practice of corporate supplier diversity going forward." Learn more about the Billion Dollar Roundtable. Our core values are driven by a desire to improve life, achieve scientific excellence, operate with the highest standards of integrity, expand access to our products and employ a diverse workforce that values collaboration. Economic Inclusion & Supplier Diversity (EI&SD) is an inclusive and integrated process that supports our corporate vision. Read our Corporate Responsibility Report to learn more. For more than a century, Merck, a leading global biopharmaceutical company known as MSD outside of the United States and Canada, has been inventing for life, bringing forward medicines and vaccines for many of the world's most challenging diseases. Through our prescription medicines, vaccines, biologic therapies and animal health products, we work with customers and operate in more than 140 countries to deliver innovative health solutions. We also demonstrate our commitment to increasing access to health care through far-reaching policies, programs and partnerships. Today, Merck continues to be at the forefront of research to advance the prevention and treatment of diseases that threaten people and communities around the world - including cancer, cardio-metabolic diseases, emerging animal diseases, Alzheimer's disease and infectious diseases including HIV and Ebola. For more information, visit www.merck.com.